Londonist Film Club looks at films with one thing in common: London. Our only rule is that the films must have either the word London or a London place name in the title. Other than that, any film is fair game. Notting Hill has one of those super cheesy rom-com reputations. That’s largely due to its having the single cheesiest line in any romantic comedy ever ("I’m just a girl, standing in front of a boy, asking him to love her"), and that is saying quite a lot. But, it’s actually quite a sweet film. And really - who hasn’t dreamt that they’d meet the celebrity of their dreams who would then fall madly in love with them? That’s just the fantasy that this film plays out. William Thacker (Grant) lives in Notting Hill, and runs a struggling travel bookshop. One day, the most famous woman in the world, actress Anna Scott (Roberts), walks into his shop. She leaves, and he’s smitten. After he makes a coffee run for his employee, he runs into Anna again, literally, and splashes her with orange juice. Being the nice guy he is, William invites her to his place to change. Handily, he lives in a memorable house around the corner, the one with the blue door. And so begins the greatest love story of our time. Well, maybe not quite. After a series of missed attempts, involving an attempted rendezvous which leads William to impersonate a reporter from Horse & Hound magazine, the two manage to have a date. William invites her to his sister’s birthday party, where Anna gets a taste of normal person life, and decides she quite likes William. The dinner party is a great example of what it would be to actually meet someone as famous as Anna (or as famous as Roberts, for that matter). Half of William’s friends pretend not to notice that this woman is hugely famous, his friend Bernie completely doesn’t recognise her, and his sister Anna has one of the greatest lines in the film as she completely freaks out - "I genuinely believe, and I’ve believed for some time now, that we could be best friends". We’re pretty sure that all of us have a favourite star who we believe we could actually be friends with, and this line rings painfully true. The romance, of course, has its ups and downs. 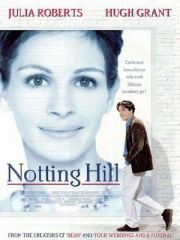 And, for the most part, they’re all set in Notting Hill, and for the most part, filmed there as well. And that’s very rare for a film. We’re used to seeing one part of London stand in for another, so a movie that is actually filmed where it is set is delightfully refreshing. William’s bookshop is based on a real Notting Hill shop, his friend Tony’s restaurant is set in a real shop, the garden Anna and William sneak into is a real private Notting Hill garden, and Williams’s house with the blue door was really Richard Curtis’s house in, you guessed it, Notting Hill. Anna stays at the Ritz while in London, and obviously lives a much flashier life than William. Her period piece film where William visits her is set at Kenwood House in Hampstead. And the final press conference where William declares his love is at the Savoy. The most we see of London outside of Notting Hill is the drive to get William to Anna for the aforementioned declaration. There’s an in-car argument about the best way to get to the hotel (for trivia geeks, those suggestions are: straight down Bayswater then down Park Lane; Kensington Church Street to Knightsbridge then Hyde Park Corner; and straight down the Cromwell Road and then turn left). The film, while a cheesy rom-com, is a good cheesy rom-com. It might not be our favourite Hugh Grant starring, Richard Curtis penned film, but it’s right up there. And it does have one of our favourite time-is-passing transitions: as William walks down a Notting Hill street, the seasons change around him from summer to autumn to winter and then to spring in what appears to be one seamless shot. It’s really quite clever. And we do enjoy a bit of cleverness from time to time. London Landmarks Spotted: Notting Hill (clearly), Trafalgar Square, the National Gallery, Canada House, Piccadilly, Kenwood House, the Ritz & the Savoy hotels. Realistic London Score: The living in London bit: 7/10. The actually meeting and falling in love with a film star bit: 1/10.